The risk of exposure to ionizing radiation is a permanent topic on the agenda of global organizations such as the International Commission on Radiological Protection (www.icrp.org), the United Nations Scientific Committee on the Effects of Atomic Radiation (www.unscear.org), the International Atomic Energy Agency (www.iaea.org), and the World Health Organization (www.who.int). The role of these global organizations is crucial, as they continuously evaluate and analyze the scientific literature on the effects of ionizing radiation and also publish recommendations and guidelines on how to safely use ionizing radiation. Education and training in radiation protection is an essential component when implementing a culture of safety among health professionals in general.15 However, it is important to be aware that knowledge of radiation protection alone is not enough, and further skills and competencies are needed to ensure education and training are effective. It is also essential to pay special attention to practical aspects regarding communication, teamwork, and the full use of radiation-reduction features available in angiography equipment. Good communication between the health care professionals involved in FGIPs is an important tool to improve clinical practice. Through preprocedural communication and postprocedural analysis, it is possible to identify pitfalls and lack of information about the FGIP and radiation protection issues. Radiographers can and should contribute to the coordination of radiation protection practice among other health professionals working in FGIPs, ensuring that all colleagues understand that radiation protection is the responsibility of each individual and act accordingly. Clearly, irresponsible and/or ignorant behavior from any member of a FGIP team can be associated with significant collateral damage to the patient and personnel. Figure 1. 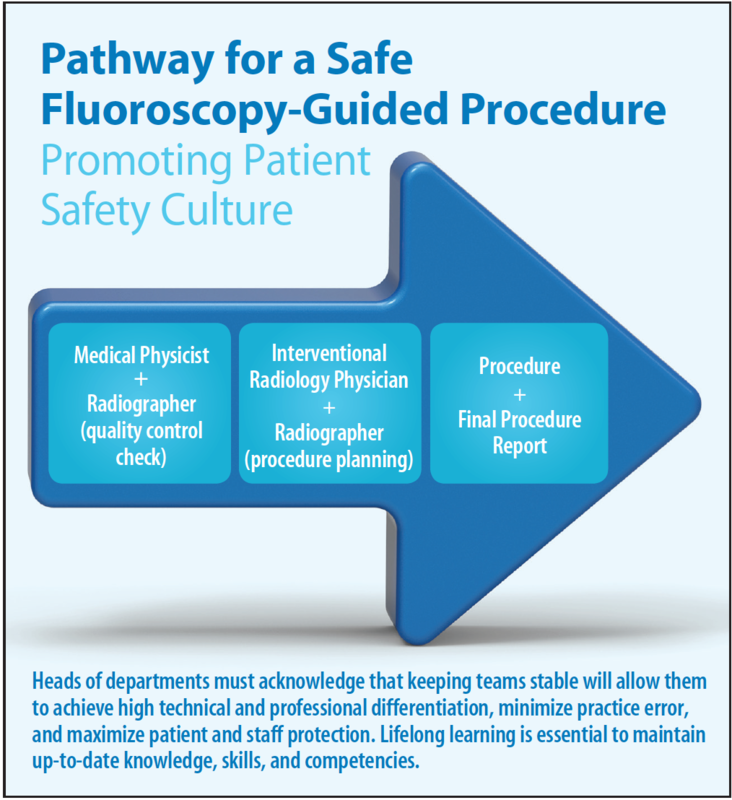 Pathway for a safe fluoroscopy-guided procedure that promotes a culture of patient safety. Figure 1 outlines a pathway for implementing a culture of patient safety for the FGIP before, during, and after a procedure. Such a pathway will minimize practice errors and maximize patient and staff protection. Before the procedure begins, it is important that the radiographer and the interventionist correctly identify the FGIP by selecting the proper procedure name and imaging protocol for the clinical task to be performed. The imaging protocol should be discussed and agreed upon with the interventionist, since the type of fluoroscopy used will affect the patient and staff dose (eg, low, standard, or high fluoroscopy mode). A recent development in FGIP is the use of cone-beam CT for imaging and guidance. This new technology requires well-trained and highly skilled staff, and radiographers have the main responsibility of optimizing its use by choosing the most adequate exposure factors to provide the required image quality, while taking into account the clinical task and the lowest required dose. The radiographer, together with the medical physicist, should develop dose reduction measures for FGIPs and implement them in daily practice. Dose reduction strategies will benefit patients and staff and include the choice of the best exposure factors, taking into consideration the patient’s anthropomorphic characteristics (exposed area, age, and body mass index), the clinical task, and equipment typology. The radiographer should also pay special attention to the use of personal dosimeters and positioning of the health professionals inside the room during the FGIP, as well as recommend proper placement of dosimetry badges where lower dose levels are expected in cases when being inside the room is mandatory. The radiographer has several important roles that contribute to decreasing patient and staff exposure to ionizing radiation: (1) working with the medical physicist and interventionist to implement a quality control model and develop optimized protocols; (2) accurately identifying the type of procedure and imaging protocol for an individual patient; and (3) maintaining a good safety culture to protect patients and staff in the daily routine. The risk from exposure to ionizing radiation exists and is an important focus of international organizations. However, the harmful effects of ionizing radiation can be diminished if the occupational exposure is maintained under recommended annual limits, the FGIP is optimized with the use of radiation reduction features on angiography equipment, and health care professionals appropriately use protective devices and attire. 1. Wall BF, Kendall GM, Edwards AA, et al. What are the risks from medical x-rays and other low dose radiation? Br J Radiol. 2006;79:285-294. 2. Tubiana M. Dose-effect relationship and estimation of the carcinogenic effects of low doses of ionizing radiation: the joint report of the Académie des Sciences (Paris) and of the Académie Nationale de Médecine. Int J Radiat Oncol Biol Phys. 2005;63:317-319. 3. Tubiana M, Feinendegen LE, Yang C, Kaminski JM. The linear no-threshold relationship is inconsistent with radiation biologic and experimental data. Radiology. 2009;251:13–22. 4. Committee to Assess Health Risks from Exposure to Low Levels of Ionizing Radiation. Health Risks from Exposure to Low Levels of Ionizing Radiation: BEIR VII Phase 2. Washington, DC: National Academies Press; 2006. 5. Berrington de González A, Darby S. Risk of cancer from diagnostic x-rays: estimates for the UK and 14 other countries. Lancet. 2004;363:345-351. 6. Valentin J. Low-dose extrapolation of radiation-related cancer risk. Ann ICRP. 2005;35:1-140. 7. Breckow J. Linear-no-threshold is a radiation-protection standard rather than a mechanistic effect model. Radiat Environ Biophys. 2006;44:257-260. 8. International Commission on Radiological Protection. ICRP publication 26: recommendations of the ICRP. Ann ICRP. 1977;1. 9. International Commission on Radiological Protection. ICRP publication 103: the 2007 recommendations of the International Commission on Radiological Protection. Ann ICRP. 2007;37. 10. ICRP, Khong PL, Ringertz H, et al. ICRP publication 121: radiological protection in paediatric diagnostic and interventional radiology. Ann ICRP. 2013;42:1-63. 11. Rajaraman P, Doody MM, Yu CL, et al. Cancer risks in U.S. radiologic technologists working with fluoroscopically guided interventional procedures, 1994–2008. Am J Roentgenol. 2016;206:1101–1108. 12. Bartal G, Roguin A, Paulo G. Call for implementing a radiation protection culture in fluoroscopically guided interventional procedures. AJR Am J Roentgenol. 2016;206:1110–1111. 13. Walden C. Occupational exposure and adverse effects in the radiologic interventional setting. Radiol Technol. 2016;87:460-464. 14. European Commission. Radiation protection no 175: guidelines on radiation protection education and training of medical professionals in the European Union. Luxembourg: Publication Office of the European Union; 2014. Available at http://www.eurosafeimaging.org/wp/wp-content/uploads/2015/05/175.pdf. Accessed July 18, 2016. 15. Vañó E, Rosenstein M, Liniecki J, et al. ICRP publication 113. Education and training in radiological protection for diagnostic and interventional procedures. Ann ICRP. 2009;39:7-68. 16. Christodoulou EG, Goodsitt MM, Larson SC, et al. Evaluation of the transmitted exposure through lead equivalent aprons used in a radiology department, including the contribution from backscatter. Med Phys. 2003;30:1033-1038. 17. Oyar O, Kıslalıoglu A. How protective are the lead aprons we use against ionizing radiation? Diagn Interv Radiol. 2012;18:147-152.